Virtually Live Events will celebrate its official opening with a triple-header on Saturday, 09 January 2010 at Virtually Live's Main Stage. 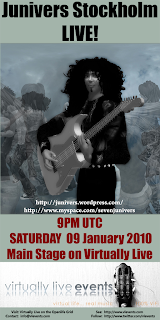 Junivers Stockholm (myspace.com/sevenjunivers), in a return visit to Openlife, will perform live at 9:00PM UTC. 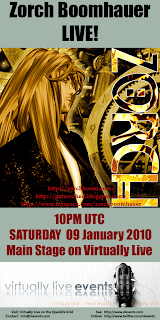 The dancing and music will continue at 10:00PM UTC as Zorch Boomhauer (myspace.com/zorchboomhauer) performs live. 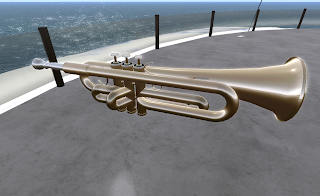 And, following at 11:00PM, DJ Gert Grigges, music, and, yes, *more* dancing! Please come join the opening party and celebration on this special night of live events!